We are proud to work with one of the leading manufacturers of quality commercial wood doors, laminate countertops, and stone surfaces in the US. Their brand is well-known and they have a reputation for excellence, which lends itself to naturally high clickthrough and conversion rates using the Google Ads (formerly Google AdWords) platform. However, we wanted to test whether making the ads more personal based on a user's location would improve engagement. Make ads more relevant to potential customers, to be measured through ad clickthrough rate and conversion rate. We separated out potential customers in Texas for one campaign. Although Texas had many impressions, clickthrough rate and conversion rate for the state were less than average for the account, and we hoped to improve it by creating ad copy that made it clear that our client catered to Texans by manually implementing Texas-oriented ad copy. In the main campaign, we created ads that dynamically inserted the name of the user's state or city into the ad copy. So with one ad we could show "Missouri Laminate – 100s of Laminate Countertops" to someone searching for laminate countertops in Missouri, and "New York Laminate – 100s of Laminate Countertops" to someone searching in New York. A 173% increase in clickthrough rate. 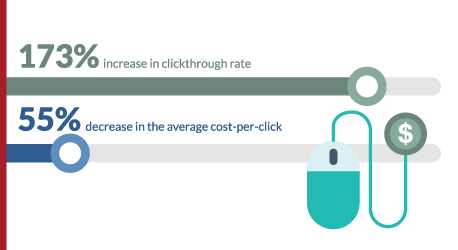 A 55% decrease in the average cost-per-click. A 14% decrease in cost per conversion. The next step is to test similar geo-targeted ad copy in other campaigns. To find out how Unidev can assist your organization with Digital Marketing, contact us today.